Thanks to our design team’s creative incorporation of graphic print into our holiday collection, we have pattern on the mind. 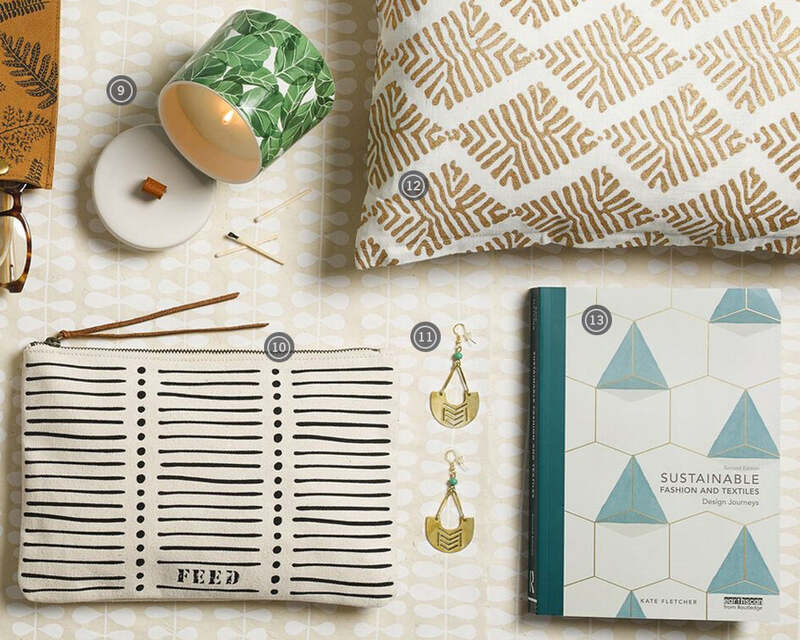 Today, we’re sharing our latest curation of conscious buys, themed around—you guessed it—all things print and pattern. From chocolate to chopsticks, we’ve got a good-for-the-world patterned find for everyone. Hand-woven by women artisans in Rwanda, this basket checks both boxes when it comes to form and function. All of the pieces in the woven collection are made by hand, with unmatched quality, to ensure lifetime use. We were happy to learn that each one also comes with a loop on back for easy hanging—appropriate since these baskets are truly works of art. These block printed notecards are pretty enough to frame, especially when you learn the origin of the design. Each print represents a block print from an artisan in India. Aside from supporting one of the longest standing craft legacies in the world, the purchase of this set is also good for the environment. Each card is made from 100% cotton recycled paper. With its intricate pattern and leather zipper detailing, the graphic Elephant Pouch was designed for self-proclaimed global adventurers (all of us). We like to keep on our bathroom shelves as our go-to morning grab, or transfer between bags to keep all our day-to-night essentials in one place. 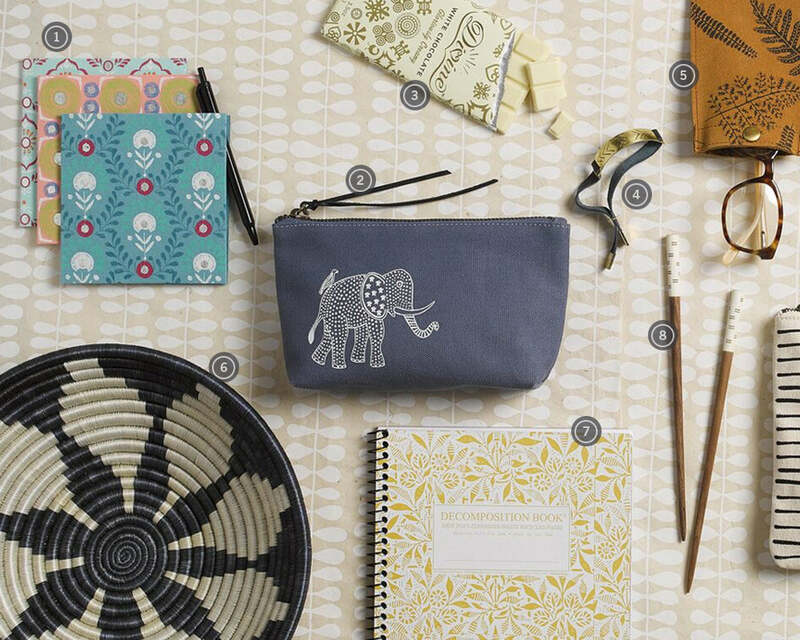 True to its global inspiration, each Elephant Pouch provides 25 school meals to children in need around the world when purchased. This chocolate is sweet for many reasons. Made from the finest quality cocoa and all natural ingredients, the hand-harvested bars take Fair Trade to the next level. Divine invites their farmers to be co-owners of the business, and invests in social initiatives in communities where their farmers work, such as education, medical clinics and women’s entrepreneurship. Oh, and did we mention how delicious the chocolate is? Living a socially conscious lifestyle means making a lot of little decisions to better the world—sometimes decisions as small as what notebook to carry to work or class. You’ve no doubt seen these patterned Decomposition Notebooks from Michael Roger Press in your local bookstore, and we’re here to tell you that they are worth the buy. The cover and pages are made with 100% post-consumer waste recycled paper, and printed with soy ink (which means the paper can be recycled again). Kate Fletcher’s beloved sustainable design book is one of our favorites. Its patterned cover also looks great on a coffee table. If you’re interested in being part of the “conscious buys” solution, this book is for you. This unique brass and leather piece, featuring hand-etched motifs, was created by talented metalworkers living in Nairobi, Kenya whose work stems from a long legacy of brass craftsmanship. By harnessing these local craft traditions, noonday collection’s artisan partners are creating dignified jobs for artisans in Kenya while helping to preserve a beautiful cultural heritage. These intricately hand-painted chopsticks from Hank by Henry are sure to elevate any weeknight dinner, and are built to last so you can use them again and again. Each set is handmade in Portland, Oregon. We’re planning to stock up on all the designs so we can check the “no utensils” box next time we order takeout—and everytime after that! This suede eyeglass case is really something special. We initially bought it for the dessert leaf print, but since it arrived, we’ve been raving about the soft saddle-hued suede from Amelie Mancini’s New York studio. Add this to your unique gift ideas list! We light this candle every day at the FEED HQ. Soy wax makes us feel good about breathing in the fresh scent of green fig and bamboo created with all-natural fragrances, and the ceramic case has added a pop of colorful pattern to our entryway. Not feeling this design or scent? Everything from Paddywax Candle here. The beauty is in the details when it comes to this striped addition to our Holiday Collection. Each Stripe Pouch features a globally-inspired print and leather detailing on the zipper. Wear it alone as a clutch, or throw it in your favorite FEED bag. Either way, you’ll feel great knowing your purchase provided 25 meals to children in need around the world. Another block-printed treasure from artisans in India that we have on top of our shopping lists. We thought this pillow design would look pretty on any couch or bed, but if the pattern isn’t for you, choose from more John Robshaw block-printed pieces here. These earrings from noonday collection have a story to tell. Each pair is made with love in Kenya, and features hand-engraved brass and delicate glass beads. The beauty comes not only from the intricate design, but also the power of each purchase to support artisan livelihoods and sustain local craft.